My first love when is comes to crochet ﻿is making baby shoes. Happy Baby Crochet actually started as Happy Baby Shoes but then progressed more to hats and photography props. What can I say....I love all baby stuff! I started making baby booties before my first son was born. I love soft sole shoes and wanted to make some of my own colors and designs. Then I made them for my friend's babies, and ultimately selling my finished work. Who doesn't LOVE baby booties? Soft and warm for a new baby's tiny little feet! I don't have a pattern to share with you today, only a photo tutorial. I am still finalizing my baby shoes pattern, but I thought these photos would help anyone who wants to make baby shoes. I will also share some links of some patterns you can try. Most of the patterns I've seen don't show enough of how the shoes look "in progress," they only shoes the finished work. Also, mastering the art of the "invisible join" isn't easy to do. I think that hiding your stitch is such an important thing when it comes to following patterns and making your product look good. Be careful not to add stitches to your work. You will have the same # of stitches before and after the join is complete. Really an invisible join just makes everything even out so you can begin the next section. As you can see in the photos, I need to even my stitch of the sole before beginning the body of the shoe, and even my stitch of the body before beginning the top part of the shoe. Invisible Join - (while working, don't forget to weave the ends of your yarn). Please keep in mind that I am a lefty (left-handed), so it will look a little different if you are right-handed. Finished Sole - Using a Yarn Needle, weave your needle and yarn through the 2nd single crochet stitch to the RIGHT (to the Left for right-handed crocheters). Add at hat and you've got a great baby gift! Well, hope you enjoyed this post and this helps a little with following patterns. Your can also search on etsy or ravelry for crochet baby shoes patterns. HIDE GOD'S WORD IN YOUR HEART. Psalm 119:11 - Your word I have hidden in my heart, That I might not sin against You! VALENTINE'S DAY is quickly approaching and just wanted to share a couple of thing with you. 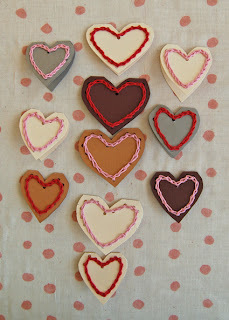 First are these adorable crochet valentines from THE PURL BEE. They have lots of crochet patterns and projects for all you crochet gals out there....check them out! I could spend all day looking at all of their cool projects. Next, wanted to share some pictures of my Valentine's Day hat. 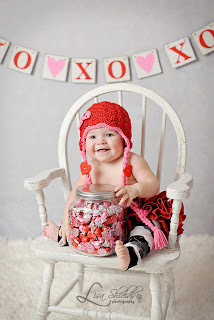 Lisa Shields Photography took these adorable photos and I thank her so much for sharing them with me... Thank you Lisa! Lastly, just wanted to say HAPPY VALENTINE'S DAY! Hope your is special and happy. I am just thankful for GOD'S LOVE this Valentine's Day. I hope I can share His love and be a blessing to someone on this day. He showed me the most AMAZING and AWESOME LOVE the day he sent HIS son JESUS to die for me and you!